Did you know that the tidal Thames can rise and fall by up to 7 metres a day? Did you also know that throughout the ages London has been affected by tidal flooding - including in 1953, when, tragically, over 300 people lost their lives along the east coast of England? 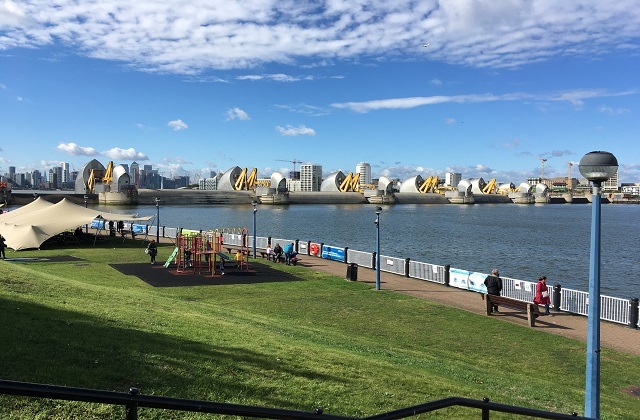 The 1953 event led to the construction of the iconic Thames Barrier, which today works with other defences along the Thames estuary to protect 1.3 million residents and £275 billion worth of property from tidal flooding. That includes key government buildings, hospitals, power stations, world heritage sites, airports, tube and rail networks and over 400 schools. The Environment Agency’s Thames Estuary 2100 team is working with partners such as councils and infrastructure providers to deliver the Thames Estuary 2100 Plan. The plan sets out how we can work together to manage tidal flood risk from now until the end of the century. London benefits from extensive and complex flood defences in the estuary, including the famous Thames Barrier, but with climate change, and more people living and working in the estuary, flood risk will increase. The Thames Estuary Plan gives us an ‘adaptable strategy’ to use to manage this future risk. Essentially we can change our approach to managing flood risk in the future depending on how conditions, such as sea level, change over time. Over time, our understanding of what the future Thames estuary will look like evolves, and these changes need to be reflected in the strategy. It’s our job to make sure we keep up with those changes and how they affect our estimates of what a future estuary will be like. This allows us to change our approach if necessary. This month, November 2018, sees the release of the latest UK climate change projections (UKCP18). This is the most important piece of climate science we have seen for several years in the UK, so it’s an exciting time for us! Our team will be using this information to check whether our recommendations for how to manage the flood defences are right. Together we work with our team to ensure we are collecting the right information so the strategy is kept up to date and reflects the aspirations of the Environment Agency and its partners. We want to be at the forefront of delivering this type of adaptable approach. Working on achieving this means we get to carry out new and exciting research with partners and find out about what others are doing at home and abroad when it comes to adapting to climate change. Whilst the strategy manages flood risk, it also aims to deliver wider benefits than just flood protection. It’s essential we work with our partners in the estuary to understand their aspirations for sustainable growth, improved public amenity and an enhanced environment. We can then incorporate these into our strategy for the estuary. Flood defences take up space so it is challenging to construct new or improved defences in an estuary where land is in demand. It’s important that we work with our partners to plan for a riverside that is better for everyone - which is why we promote an approach where local aspirations and flood defence requirements can be brought together in a single vision. We are currently working on reviewing the entire strategy and updating our recommendations. We will publish an updated Plan in 2021. The Plan also includes objectives for maximising the environmental, social, cultural and economic value of the tidal River Thames, its tidal tributaries and its floodplain. This supports the ambitions of the Government’s 25-year Environment Strategy by increasing the natural capital of the Thames and enhancing the value of the river to society. The Environment Agency is investing over £2.6 billion of government money to better protect the country from flooding and coastal erosion between April 2015 and March 2021. This includes over 1,500 schemes, which will better protect 300,000 from flooding into the future. If you’re interested in hearing more about the current strategy, or how to get involved in the review and update, then sign up for our quarterly newsletter by emailing thamesestuary2100@environment-agency.gov.uk.